Hello! I’m Keirthana 🙂 Welcome to my website. I am an Information Developer at Hewlett Packard Enterprise, Bangalore. I am an engineer by chance and a writer by choice. I enjoy technical writing and creative writing equally. I also love playing around with Adobe Photoshop and Illustrator, learning things on the go. I try to learn more about these tools by creating basic posters and illustrations. To know more about my professional skill repertoire, contact me for access to my career profile page. You can contact me using twitter, facebook, or use the contact form on my blog. I am happily married to my childhood sweetheart (featured in my writing as Adit or as hubby), whom I have known almost all my life. I believe that love, being in and building a long, strong relationship has taught me more than anything else in life. I am also a new mother spending her time being happy and at the same time terrified about parenting. My little princess (featured in my writing as Aditi), teaches me new lessons in ways that I couldn’t have imagined ever. I enjoy reading – mostly fiction, cleaning, organizing, writing, blogging at Reflections, occasionally trying out paper art, and spending lazy weekends indulging in debates about theism and atheism, society, feminism, karma and other seemingly important worldly and unworldly concepts with Adit. Of course, now Aditi rules my life and all my hobbies have taken a backseat. After becoming parents, we do miss the lazy weekend afternoons when we enjoy doing absolutely nothing but Aditi’s precious smile washes away any wistful feelings. I don’t like to label myself or others but as human tendency goes, we all associate different labels to understand people. To interpret them in our own quirky ways. So even if the labels keep changing throughout our lives, we do think in terms of different traits when we try to know other people. 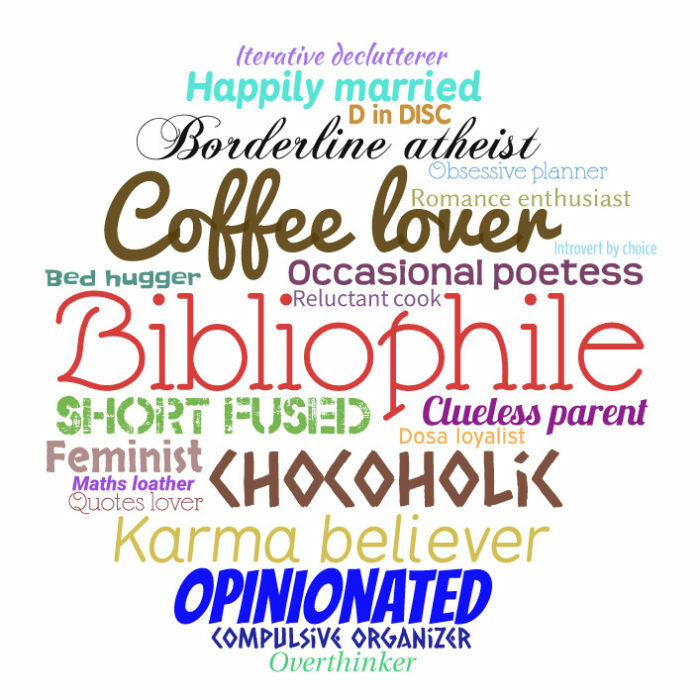 So, here are some labels that I think I can associate myself with. Some need working on for the greater good while others don’t. I am constantly learning to accept myself and the world as is and would like to believe that mastering acceptance is the road to the ever elusive inner peace.